Semitic activity on North American university campuses. This virulent anti-Semitism is disguised as opposition to Israel’s policies, but it calls for Israel’s destruction and threatens Jews on campus. 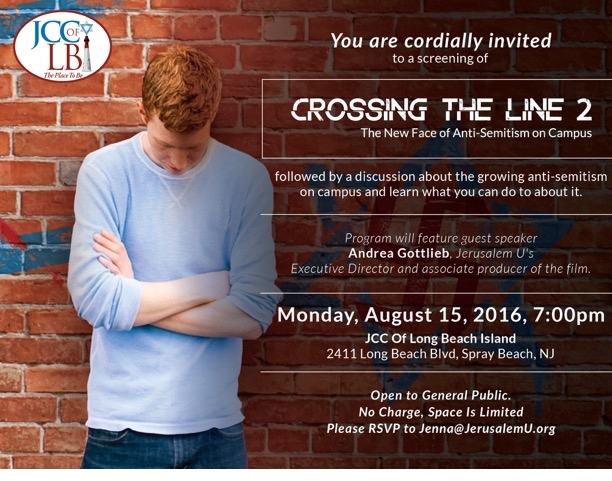 Following the showing of Crossing the Line 2, Andrea Gottlieb, Executive Director of JerusalemU.org in Philadelphia, will discuss the questions raised in the film and try to answer some of them: When confronted with anti-Semitism on campus, what can people in the community do? How should we be preparing our young adults before they go off to college? How will dealing with anti-Israel and/or anti-Semitism on campus affect our children’s identities? What are some resources for kids to reach out to for help once they are on campus? How can parent/grandparents reach out to colleges about these issues? There is no charge for this film. A donation would be appreciated.